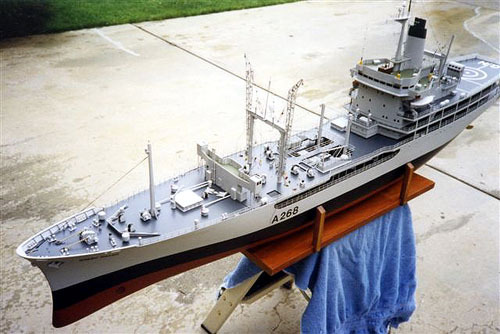 Trevor began this project with plans from Floating Drydock's AM267 Minesweeper plans in 1/48th Scale which were enlarged to 1/24 scale. . 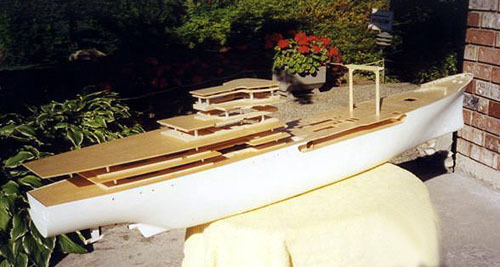 This ship was built using plywood frames sheeted with 1/8" balsa, then fiberglassed with mat, followed by a cheesecloth layer, resulting in a very strong hull. 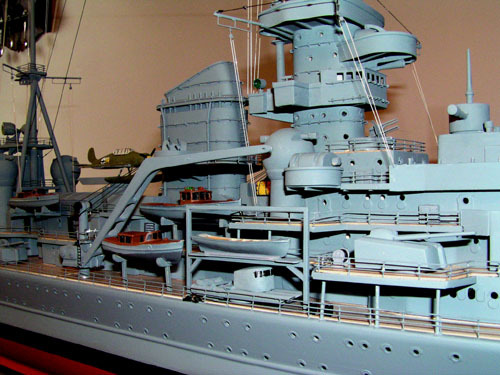 Decks and superstructure were made from Plexiglas. 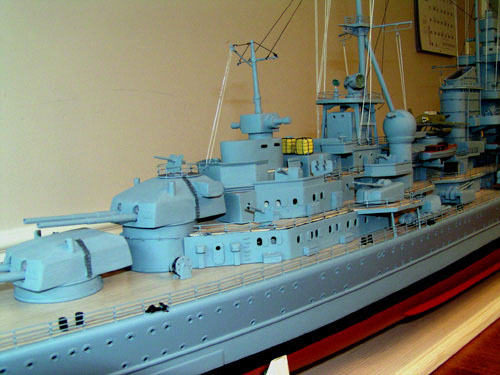 The 3" /50 was scratchbuilt, along with many other fittings .20mm and 40mm guns were purchased from HR Products and are very nice castings compared to some that I had purchased before in other scales. Doors and life rings were purchased from Quartermaster. Running hardware begins with two 12 Volt Pittman 3700's powering Prop Shop 3 5/8" cast propellers. 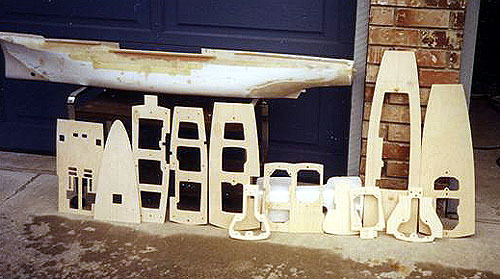 Motors and Props were purchased from Harbor Models. 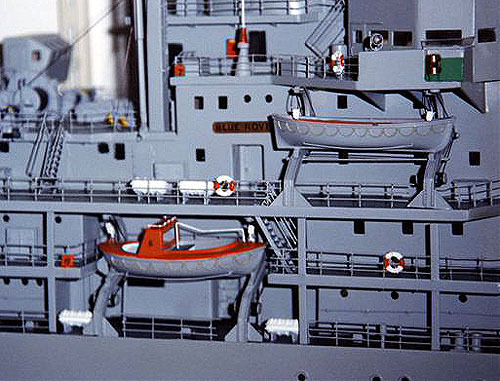 Inside the hull ,under the bow, is a home made air compressor with lines that run aft. 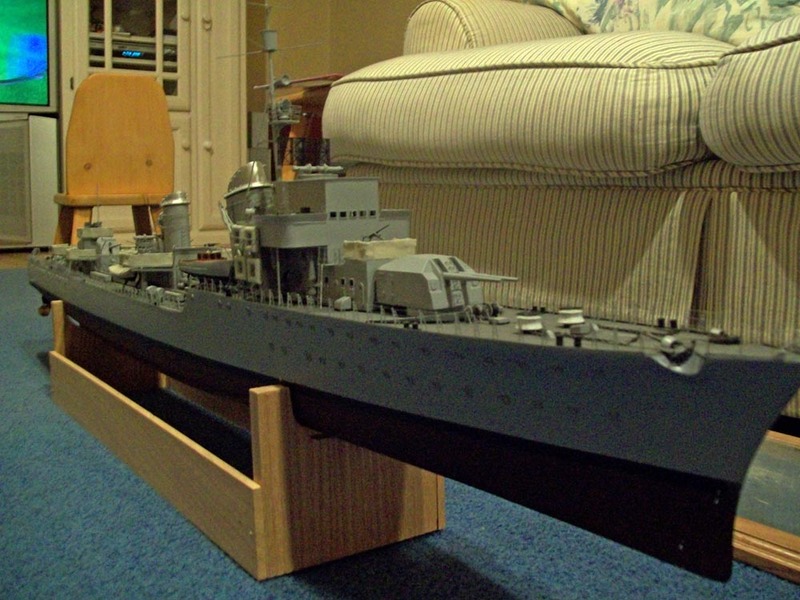 This set will be used to Launch the depth charges from the K Guns, which are yet to be built. There are also two solid brass anchors, picked up on eBay that are attached to 30' of chain connected to a gear driven home made winch. Battery used is a Group 24 truck battery, allowing for many weeks of runtime before charging. 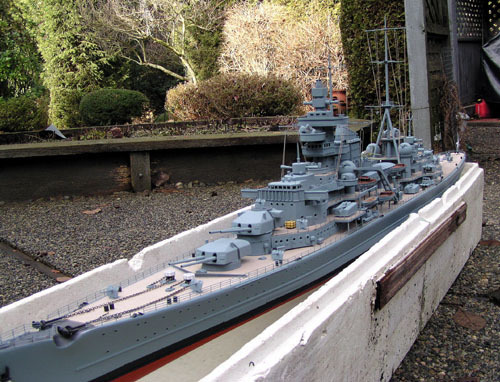 This ship weighs in at around 200lbs ballasted to the boottopping. Power distribution for all the features such as speed and lights, anchor winches, aircompressor and so forth, is run through a Harbor models power distribution box. 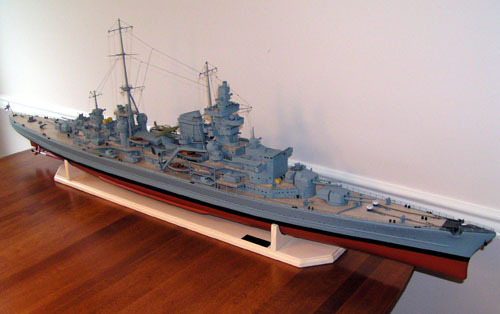 This is an awesome little unit that I highly recommend to any large ship modeler. Speed controls are two MCD sc330's. 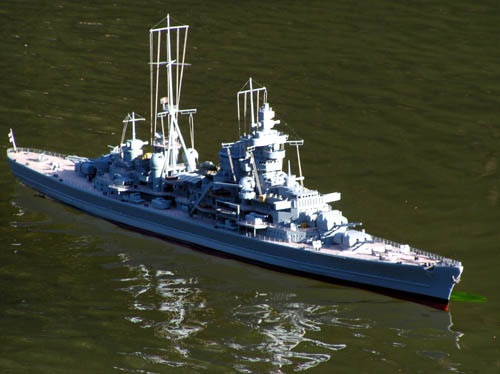 Atlantis is completely scratch built, the hull being fiberglass, deck and upper works various dimensions of plywood, masts and sampson posts hardwood dowelling, derricks and handrails brass stock. 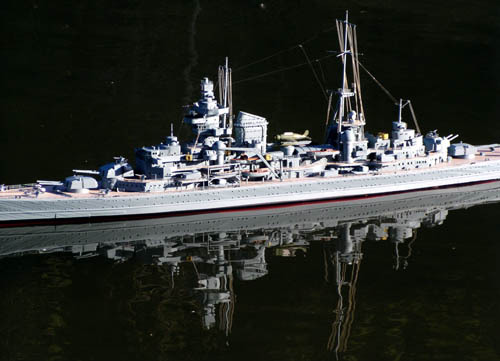 She is finished under the guise of the Dutch motor ship Abekerk and showed the name and port of registry strictly for information at regatta meets. 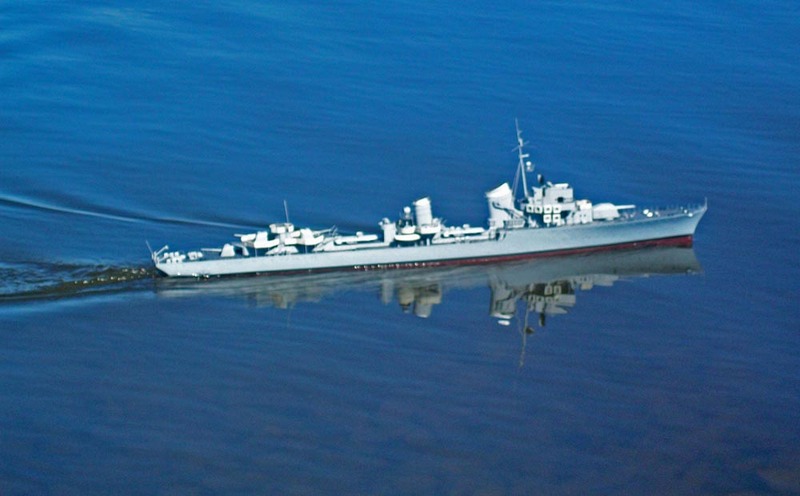 She performs on the water like any other single screwed merchant ship and manouverability is not one of her strong suits. 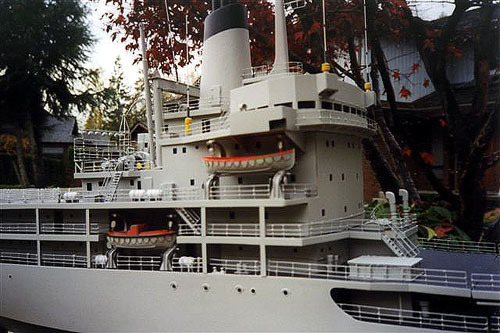 The Atlantis was built from John R. Haynes Plans. 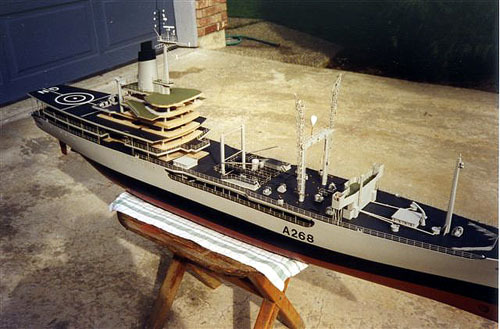 Bill also sent in photos of this ambitious project, a scratchbuilt fleet oiler from the Royal Navy that served for over 20 years, and was later transferred to the navy of Indonesia. 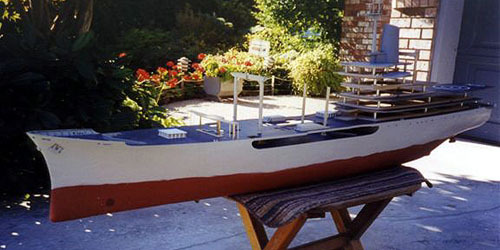 Bill sent in these photos of his latest project, built on a Fleetscale hull with small boat set. 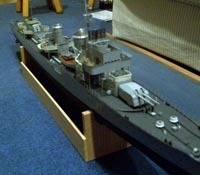 All the rest was scratchbuilt including the running gear and bilge keel. 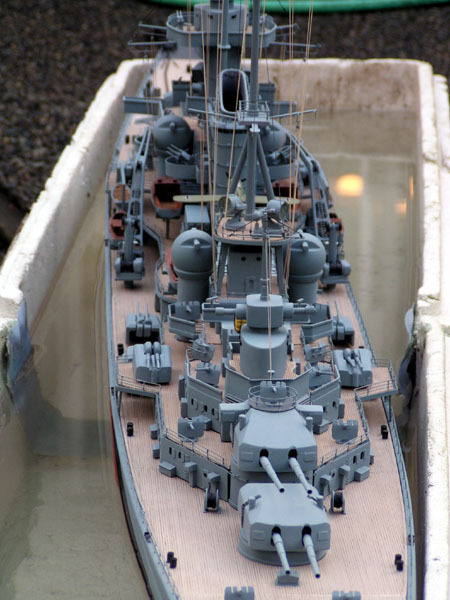 Note the photo showing her in dry dock for ballasting and trim. 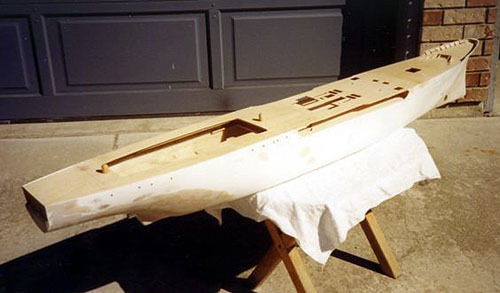 When Bill received the hull he was very pleased with the quality but thought the hull was a bit on the heavy side, so all through the consruction particular attention was paid to weight. This was a good idea, because after installing three motors, speed controllers and a respectable battery she required very little ballast. 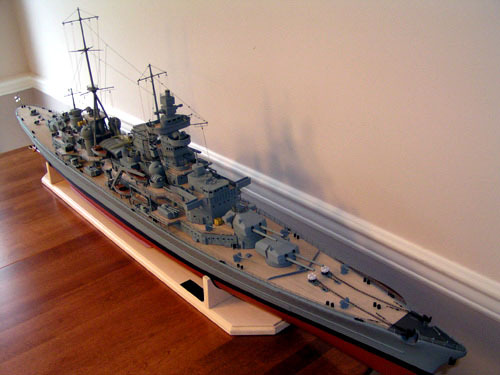 Boetty sends in these photos of his 26 year old model of the German Battleship Tirpitz. 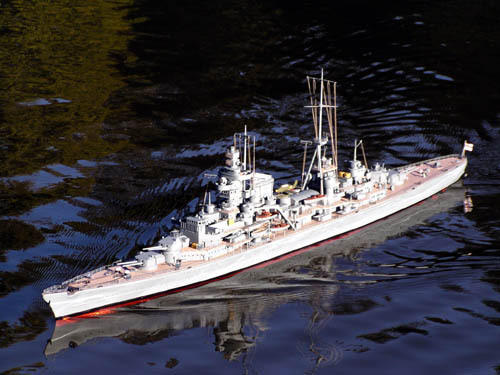 As you can see, the main armament can shoot water and air, giving a bit of action to this model.